The extinction of one carnivore species can trigger the demise of fellow predators - a phenomenon called horizontal extinction cascades, where extinctions of carnivore species can have a ripple effect across species triggering further unexpected extinctions of other carnivores. Using insects, the research team Frank van Veen, Dirk Sanders and Rachel Kehoe from the Centre for Ecology and Conservation at the University's Penryn campus in Cornwall, set up experimental communities with complex food webs in 40 four-square metre outdoor field-cages which they observed over a spring and summer season. These communities consisted of several species of aphids and their natural enemies, parasitoid wasps. 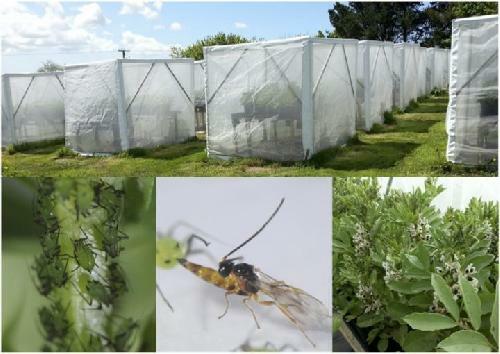 They found that removing one wasp species led to an increased rate of extinction in other species of wasp, an effect that was transmitted through changes in density of the aphid species. The study found that once one wasp species was removed its aphid-prey grew in numbers, crowding out the other aphids and making it difficult for the other wasp species to locate their particular food resource, eventually leading to their extinction. For that reason, rather than focus on the conservation of a single species, as is often the focus of environmental fundraising efforts, science should be adopting a whole system approach that also includes fellow predators. "This is a unique experiment. Usually these research questions are tackled with theoretical approaches and researchers focus on extinctions after the loss of food species. This is the first time anyone has looked at mechanisms of horizontal extinction cascades in a natural large field experiment," said Dr Sanders, an associate research fellow in the Centre for Ecology and Conservation. "Such extinction cascades are seen as a major thread to biodiversity but it is very hard to get data about this happening in nature, due to the many different influences. Knowing how such extinction cascades can happen gives us a better understanding and helps us to predict when they might happen. If we want to protect an endangered carnivore species, for example, we might need to protect other predators around it, which is quite an important message."